The visit went well and bedside manner was excellent. However, timeliness of cleaning and exams lasted 2 hrs. Usually, hygienisttakes care of cleaning and exams . Dentist comes in and review during a cleaning appt. The visit went well and bedside manner was excellent. However, timeliness of cleaning and exams lasted 2 hrs. Usually, hygienist takes care of cleaning and exams . Dentist comes inand review during a cleaning appt. Great place, would definitely come again. Very professional, very empathetic, they even have Netflix! 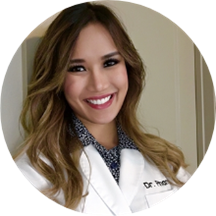 Dr. Kim Pham is a Houston-area general dentist with extensive training in family, cosmetic, and pediatric dentistry. A native Texan originally from Austin, she was the salutatorian of her high school class and attended the University of Texas at Austin as a National Merit Scholarship recipient. She was an early graduate from college with honors, earning her Bachelor of Science (B.S.) degree in Biochemistry. She then received her Doctor of Dental Surgery (D.D.S.) degree at the University of Texas Dental Branch at Houston. Dedicated to pursuing the highest standards in dental care, Dr. Pham continues to train in the latest clinical techniques and implements the most current technology and methods. She is proficient in all aspects of general and pediatric dentistry and basic orthodontics. She maintains additional certifications in moderate enteral sedation, which allow her to provide a comfortable dental experience for anxious patients. This, along with her soft touch and calming bedside manner, makes her one of the best dentists for children or nervous adults. When not practicing dentistry, Dr. Pham enjoys traveling, snowboarding, and scuba diving. She loves working with her hands and is also a trained classical pianist. Everyone that works there was nice to me and Dr. Pham was great. I had a lot of confidence in her. Exceptional service, very refreshing and easying office and staff who were very helpful, friendly, and patient. Highly recommended. Super sweet & gentle ! The staff was very friendly and the dr was very informative about what needed to be done. I just loved the assistant she was very funny and friendly!! 5 stars across the board for this place!! Highly recommend this place! !